On January 11, a new fishery management system took effect in ocean waters off California, Oregon, and Washington. Federal fishery managers consider the new system to be a safer, more sustainable management plan because it assigns individual fishermen a portion of the entire fishing fleet's annual quota and is designed to guarantee them an income while safeguarding against overfishing. But three groups, composed mostly of small-boat fishermen, have jointly sued the US Secretary of Commerce and the National Marine Fisheries Service in an attempt to halt what they say is a recipe for industry consolidation, loss of jobs, and, with time, corporate ownership of the ocean's resources. The lawsuit, filed last fall, is pending in San Francisco federal court. "Banks, processing plants, and big corporations could end up with ownership of fish before they're even caught," said Mike Hudson, a commercial fisherman in Berkeley. "They'll buy all the little guys' quotas and eventually just a few boats will be doing all the work, and hundreds of small fishermen will be out of work." Although such a grim scenario, if realistic, is probably years away, the new management system already has granted the lion's share of the catch to just a few boats. Ninety percent of the West Coast's quota of groundfish, a category of almost 100 species of bottom-dwellers, has been reserved for about 200 trawlers, or vessels that drag nets over deepwater habitat and scoop up tons of fish at once. Moreover, each trawler has received an individual quota, an amount that fishery managers calculated based on how many fish each boat caught in past years. The remaining 10 percent of the total groundfish catch will be shared among approximately 1,000 small boats that fish, like Hudson does, using hook-and-line. "The individual catch share system is a radical change from [previous] fishery management," explained Brian Gorman, spokesman for the National Marine Fisheries Service, a branch of the National Oceanic and Atmospheric Administration and one of the targets of the pending lawsuit. "We still tell fishermen how many fish they can take based on each fisherman's historical catch reports, but now they can catch those fish anytime they want." The old way of commercial fishing — a frantic, competitive, sometimes dangerous race to catch as many fish as one could as fast as one could — will be no more, Gorman noted. But the lawsuit's plaintiffs — the Pacific Coast Federation of Fishermen's Associations, the Crab Boat Owners Association, and the Port Orford Ocean Resource Team — allege that by doling out individual limits, the government is turning the ocean's fish into private property, subject to being bought, sold, leased, and, in the worst-case scenario, consolidated into the possession of wealthy individuals and corporations. "They're saying that each fisherman will own a piece of the pie," Hudson said. "But the scary part for the little guys is that just as soon as you own something, you can lose it." Zeke Grader, the executive director of the Pacific Coast Federation of Fishermen's Associations, expects corporate control and consolidation to occur fast and drastically, with fishing economies withering in small towns like Morro Bay, Fort Bragg, Coos Bay, and Newport. Those who helped design the system — a panel called the Pacific Fishery Management Council, or P-Council — maintain that they've installed safeguards against such an outcome. They included a prohibition against fishermen selling their catch shares for the first two years. But after that, fishermen will be able to handle their individual quotas like any other assets or property, and Grader believes that once the buying and selling begins in 2013, the West Coast's trawling fleet of 160 currently active boats will shrink to 35 to 45 boats within several years. Though commercial hook-and-line fishermen will not be assigned individual catch shares and will still be allowed to target groundfish as they always have, Hudson, who fishes mostly for albacore, sablefish, and crab, says all commercial fishermen will be impacted. He envisions what might happen to coastal towns, whose economies depend on one or two trawlers, if a big corporation bought those two trawlers' catch shares. "I'm not a big fan of trawling, but we do need them to keep some of these economies running," he said. "If they stop bringing in fish, then for the guy who runs the local ice house it becomes less feasible to keep his business running. Then, without ice at the dock to put fish on, the rest of the us fishermen really can't fish." Entire fishing towns could go belly up, Hudson said. But Frank Lockhart, a National Marine Fisheries Service regional administrator and a member of the P-Council, says severe consolidation won't happen. Maximum limits on how much one person can own of a given groundfish species' annual quota were imposed to prevent the resource from falling into the hands of a few owners. These caps go as high as 20 percent for several species, but an overall limit of just 3.2 percent applies to ownership of quotas for combined species. However, Grader believes these safeguards will crumble because corporate interests and individuals will be able to easily work around them by purchasing available catch shares in the names of multiple people closely affiliated as business partners. Grader quipped that "friends, girlfriends, dogs, and even potted plants" could become owners of catch shares at the oversight and direction of one silent partner. A catch share system similar to that of the West Coast was imposed upon the trawl fishery of the East Coast last May. As a result, according to some sources, many small boat fishermen are already out of work. But the feds behind the system tell a different story. "We know that a few individuals who were given small catch shares are struggling, but overall revenues are up," said Maggie Mooney-Seus, spokesperson for the National Marine Fisheries Service's Northeast Region. On the West Coast, Gorman predicts a very bright outcome for fishing economies. "Under ideal circumstances, the amount of money coming into a fishing community will go up and bring a cascade of benefits to its businesses," he said. He added part of the goal of the catch share system "is to make it more economically efficient to catch fish." 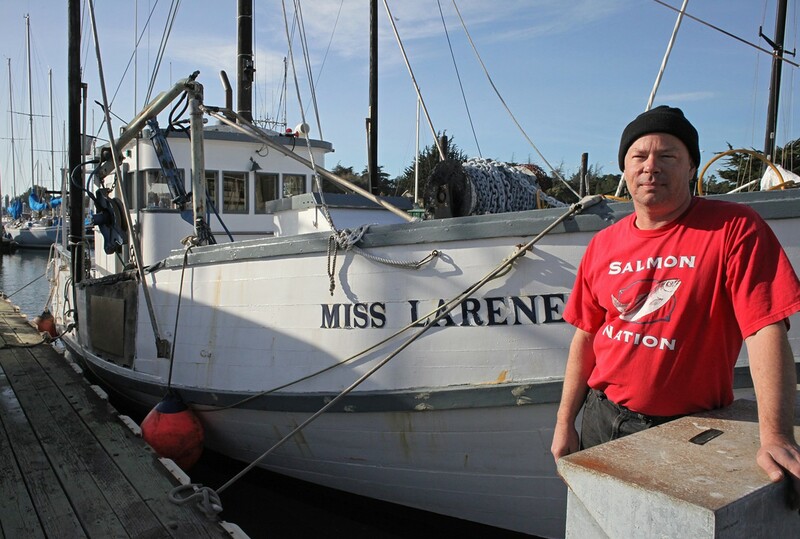 But that means danger to San Francisco commercial fisherman Larry Collins. "Trawlers are more efficient. They use less people and catch more fish, and the fewer trawlers you have, it's even more efficient," said Collins, who serves as president of the Crab Boat Owners Association. "But efficiency in commercial fishing isn't necessarily sustainable." Collins, Hudson, other small-boat fishermen, and Grader all claim that trawl boats led to the late-1990s collapse of many bottom-dwelling species, some of which are still recovering today. "And now they're handing over 90 percent of the fish to the big pigs that ruined the fishery to begin with," Collins said. Even if the worst predictions of economic ruin never materialize, Collins believes privatizing the ocean violates the most fundamental ethos of fishing. "We used to all own the fish," he said. "You didn't own a fish until it hit your deck."